1 of 3 g a large pot of lightly salted water to a boil. Add fettuccine and stir so strands do not stick together. Cook 12 minutes or as per package directions. Drain, reserving 1/2 cup of the pasta water. 2 of 3 Meanwhile, heat oil in a large nonstick skillet over medium heat. Add onion and garlic and cook 5 minutes. 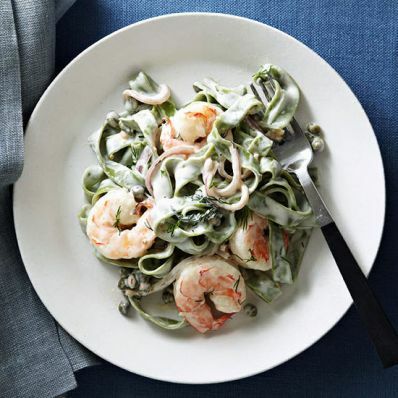 Stir in shrimp, cream cheese, cream, dill, capers, lemon juice, pepper and salt. Cook 3 to 5 minutes, until shrimp are cooked through. 3 of 3 Stir cooked pasta into sauce, along with some of the reserved pasta water. Serve immediately.